As all cigar enthusiasts know very well, having a humidor is a must for keeping your cigar collection fresh and delicious for prolonged periods of time. By keeping your cigars humidified and at the right temperature, these devices can ensure they will have a long shelf life. For that reason, acquiring a best humidor cabinet﻿ for your cigar collection is a must. If you are particularly serious about your cigar collection, however, a humidor cabinet is the logical next step. With all that in mind, this buyer’s guide will review five of the best cigar humidor cabinets on the market. As a bonus, it will provide useful information about humidor cabinets in general. If you are worried about the safety and well-being of your cigars, worry no more. As durable and sturdy as it is imposing, this product by Prestige Import Group is capable of keeping up to 250 cigars humidified and protected at the same time. Made of high-polished diamond plate metal, this cigar humidor cabinet is incredibly tough and durable. Functional and effective, the Prestige Import Group Diamond Countertop Humidor features two access doors, four glass sides for display and four plexiglass removable trays. What is more, for monitoring and controlling the state of your cigars, this humidor cabinet features two internal humidifiers and an external hygrometer. At any time, you can see these components through the humidor cabinet’s glass sides. 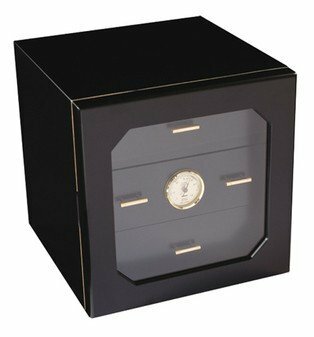 Without a doubt, one of the most important characteristics of this humidor cabinet is its great level of security. On one hand, it’s made of strong, durable materials that can’t be easily destroyed. On the other, it features high-quality locks both in its front and its back doors. Meanwhile, the cabinet’s large reinforced glass windows showcase the cigars elegantly from every direction. Taking everything into account, it’s tempting to say that this product by Prestige Import Group is one of the best all-around humidor cabinets on the market today. While it’s not the most elegant or stylish, it is certainly effective at keeping your cigars protected, humidified and beautifully displayed. 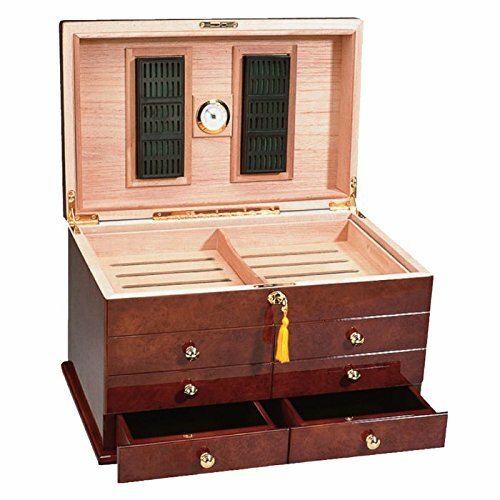 Elegant and traditionally-styled, this cigar humidor cabinet can help you keep your cigars humidified and secure. It is made of Spanish cedar wood, and it has a beautiful cherry lacquer finish. To keep the cigars protected, it has seven drawers pull out drawers and a swing door. Perhaps what is most notable about this cabinet by Prestige Import Group is its balance between elegance and functionality. On the outside, it looks like an elegant piece of furniture styled in a traditional, refined manner. On the inside, however, it is actually a state-of-the-art device for keeping your cigars humidified and delicious. To this end, it uses seven different humidifiers and a built-in hygrometer. As previously mentioned, to keep your cigars secure, this humidor cabinet features a swing door and seven different pull out drawers. To ensure no one will get into your collection without permission, the cabinet also has a lock that is impossible to crack without the right key. With everything on the table, it is easy to admit that this product by Prestige Import Group is of superior quality. Apart from being elegant and stylish, it is very effective at keeping up to 210 cigars in seven pull out drawers perfectly humidified. What is more, it is also very secure due to its high-security lock. Does not allow displaying your cigar collection. The built-in hygrometer is analog and not of very good quality. Despite not being the largest humidor cabinet in this list, the Ravello Humidor HUM-300GR Sure Seal Technology Humidifier is able to hold up to 300 cigars, keeping them humidified and ready to be enjoyed. To achieve this, it has various pullout felt-lined drawers and a larger compartment on the top. As previously mentioned, this humidor cabinet is capable of holding up to 300 cigars at the same time. Its capacity is not all, however. Made of high-quality Spanish cedar wood, it’s protective and durable. What is more, it is cleverly designed using dividers, making it easy for you to organize your cigar collection as you see fit. As you probably already know, a good humidor needs to be capable of keeping its humidity and temperature at stable, constant levels. This is impossible, however, if the humidor is not correctly sealed. To prevent leaks from happening, this product uses its manufacturer’s proprietary SureSeal technology, ensuring a proper, tight seal on closure. Without a doubt, the Ravello Humidor HUM-300GR Sure Seal Technology Humidifier is a good option for cigar enthusiasts with large collections. 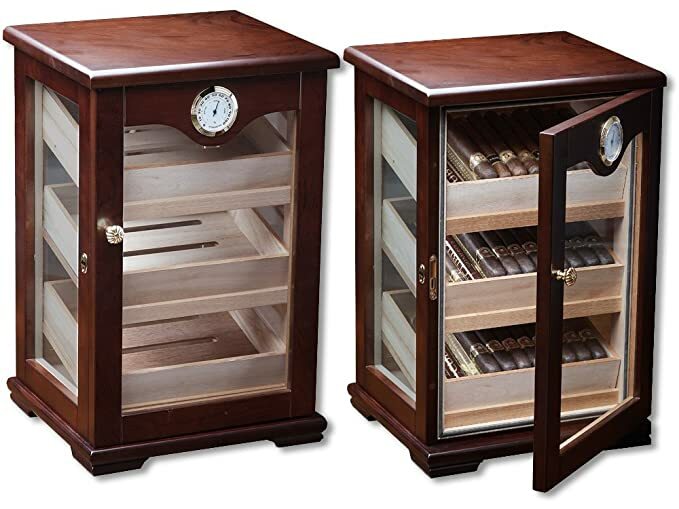 Despite its large capacity, this humidor cabinet is compact and very practical in its usage. Incredibly, even after being filled at capacity with 300 cigars, this cabinet has enough space left over to store various different accessories. Can hold up to 300 cigars. Not all drawers are functional. If you are worried about the security of your beloved cigar collection, this just might be the right product for you. Resembling a small safe box, there is no doubt that the Adorini Humidor Chianti Deluxe has a unique and stylish look. What is more, as its style suggests, this cabinet is incredibly protective and secure. Without a doubt, the Adorini Humidor Chianti Deluxe stands out due to its extra features. For one, it has a high-quality pre-calibrated hygrometer that has been optimized for cigar storage. Furthermore, this cabinet features an extra-strong corpus that plays off the Spanish cedar of its lining perfectly. Even further, it has an innovative divider system and label clips. With a capacity of 100 cigars and having various useful features, this humidor cabinet can be a great choice for those with small or medium-sized collections. Even though it is lightweight and it can fit basically anywhere, this cigar humidor cabinet has all the features and characteristics that you would expect from a pro-level product of its kind. 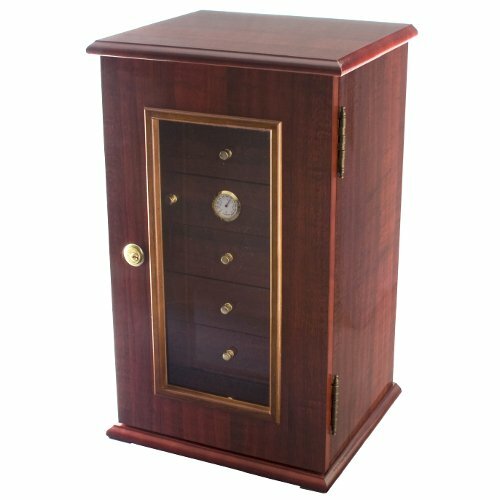 Having examined everything about it, it can be said about this cigar humidor cabinet that it is innovative and effective. Despite not having the most advanced humidifying technologies, it is efficient at keeping your cigars healthy and delicious. As a welcome bonus, it has advanced security capabilities and a unique look. Does not have a large capacity. Does not have separate compartments. Another great product by Prestige Import Group, the Milano Countertop Display Humidor is capable of holding and maintaining up to 125 cigars at one time. Made of luxurious dark mahogany, this countertop display is both elegant and protective. What is more, its four glass sides make it a perfect 360-degree display for your cigar collection. Without a doubt, the most notable characteristic that this humidor cabinet has is its humidification system. In order to keep up to 125 cigars perfectly humidified at all times, the device features two state-of-the-art humidifiers. Taking into account the cabinet’s size, having two humidifiers may seem excessive. However, both are positioned and calibrated in a way that results in perfect humidification. As was previously mentioned, this humidor cabinet features glass sides that allow it to function as a display for your cigar collection. This feature takes this product to a new level when it comes to looks and style. Despite not being the most functional or good-looking cigar humidor cabinet on the market, the Prestige Import Group Milano Countertop Display Humidor has a few advantages over the competition. For one, its 360-degree display is elegant and functional. What is more, its two humidifiers ensure effectiveness at keeping your cigars fresh. Its cigar trays are roughly constructed. It does not have a large capacity. Before purchasing a humidor cabinet, make sure that it has enough capacity to store your entire cigar collection. In fact, if possible, look for a humidor cabinet that can store more cigars than you have. That way, when your collection grows, you will not have to buy another humidor. Without a doubt, the lining of your humidor cabinet should be pure Spanish cedar wood. That material has been proven to retain interior humidity and temperature in a way that other materials can’t. In terms of exteriors, you can get either solid wood or veneer. Of course, a veneer is cheaper but also less protective and durable. On the other hand, solid wood is more expensive but overall more effective, more elegant and better at maintaining humidity. By all means, a humidor should have a tight seal. If it doesn’t, humidity and temperature levels will drop to negligible levels within hours. A good way to know if your humidor was a tight seal is by taking a new, crisp dollar bill and trying to slide it through the space between the humidor’s lid and its base. Humidor cabinets are not only made of wood. Certain key parts such as hinges, locks and others, however, are typically made of high-quality metal such as stainless steel, silver or even gold. In particular, hinges are important. High-quality hinges will prevent the lid from becoming either stuck or too loose, resulting in sealing problems and other issues. Undoubtedly, there are two types of hinge that soar above the others. One is the quadrant hinge, a component that has arcs that connect to the top and bottom of the frame. The other is the “piano” hinge, a system that runs along the entire length of the back of the base, resulting in added pressure being applied to the lid. Doesn’t matter which one you choose, make sure it provides a tight seal. As previously mentioned in this article, there is no material preferable to Spanish cedar wood when it comes to the lining. In addition to humidifying and protecting them, this wonderfully fragrant wood injects a rich character to your cigars. What is more, this fine material is incredibly resistant to cracking. Most woods are prone to cracking due to the natural contractions and expansions that come with time. All deluxe humidor cabinets have certain extras that make the experience of using them more engaging. Without a doubt, one of the most useful is the divider, a simple tool that allows you to keep different types of cigars apart in separate sections. Also important, there are tools that allow you to monitor and control the state of your cigars, including humidors, hygrometers, thermometers and others. Even further, there are accessories such as special keys, hidden cabinets and many others. Hopefully, this buyer’s guide has provided you with the information you needed about cigar humidor cabinets. With this knowledge, you will be able to make the best decision when the time comes to purchase one of these useful devices.